Sometimes if you want the job done right, you have to go with a few, shall we say, undesirables. 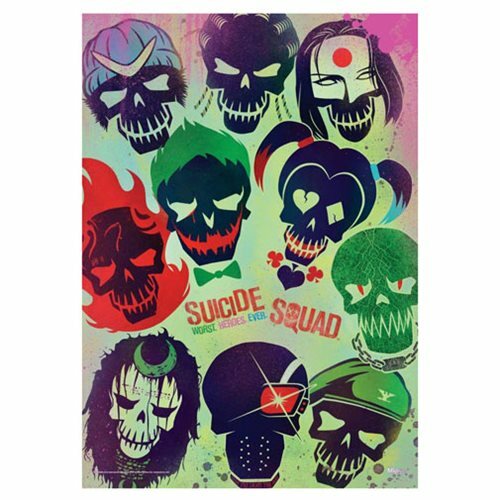 Bring the mayhem of the Suicide Squad to your collection with this Suicide Squad Worst Heroes Ever MightyPrint Wall Art Print. The print features animated skeletal headshots of each member of the squad. Measures about 24-inches tall x 17-inches wide. What makes MightyPrint wall art so unique? MightyPrints are made to last. Due to the prints' high quality and durability, you won't have the typical difficulties of tearing, fading, or warping. They're vibrant in color, making them a welcome addition to any collection. In addition, MightyPrints are made to diffuse light, bringing the colors to a new level when back lighting is present. Place yours in front of a window or in an LED illuminated light box (sold separately) and be amazed! Ages 13 and up.